Standing on Luza Square among some of Dubrovnik’s most impressive architecture, including St Blaise Church and the lovely Sponza Palace with its appealing mixture of Gothic and Renaissance architecture, Orlando’s Column was erected in 1418 at what remains the political and social heart of the city. Here public meetings and executions were held on the small stone platform guarded by wrought-iron railings that tops the column. The stone carvings adorning the four sides of the column were created by master craftsman Antun Dubrovcanin and represent the heroic knight Orlando, who was the nephew of Frankish Emperor Charlemagne; according to legend he was credited with saving Dubrovnik from Saracen pirates in the eighth century and here he is depicted surrounded by figures of minstrels and balladeers. 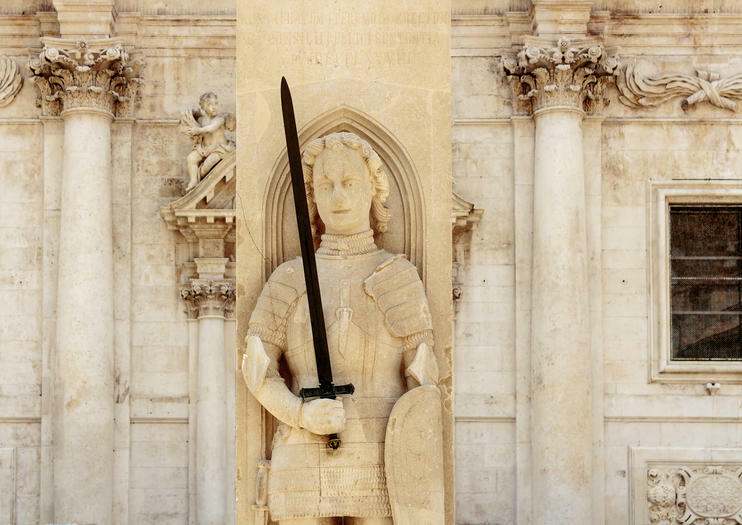 As well as the length of Orlando’s arm becoming a common measurement in the city, the column has come to represent the freedom of Dubrovnik and the white flag of the Republic always flies above it on public occasions, including the opening of the annual Dubrovnik Summer Festival in July. Luza Square, Dubrovnik. Open 24/7 and free to all; best accessed on foot in the pedestrianized Old Town. Discover Bosnia-Herzegovina, Montenegro and Croatia on this 4-night tour from Dubrovnik. Explore Dubrovnik Old Town and its bevy of UNESCO-listed sights; journey through Župa Dubrovačka valley to the Bay of Kotor in Montenegro; and trace the Neretva River delta to the towns of Počitelj, Medjugorje and Mostar in Bosnia-Herzegovina. You’ll enjoy ample free time to sightsee independently as well benefiting from the services of your guide. Daily breakfasts and four nights of 3- or 5-star accommodation in Dubrovnik are also included. Discover Dubrovnik and the charming coastal town of Cavtat on this private half-day tour. Spend the morning exploring the highlights of UNESCO World Heritage–listed Dubrovnik Old Town. Wander through the cloisters at the Franciscan Monastery, gaze up at Orlando’s Column, and capture postcard-worthy photos of Sponza Palace, the Church of St Blaise and more. Then, soak up the impressive coastal views on route to nearby Cavtat, where you’ll enjoy a personalized tour of the 6th-century town. Explore 16th-century history on Croatia’s Dalmatian Coast on this 1-hour walking tour of Dubrovnik. Follow your guide on a tour through Dubrovnik’s ancient streets and gain insight into the city’s colorful past. Discover top sites of interest including Onofrio's Fountains and the Franciscan and Dominican St Saviour Church. Head along pretty Prijeko Street to the Old Port, and learn of the city’s trading and maritime endeavors. During your tour, explore Croatia’s rich folklore, and hear tales of ancient legend concerning Sponza Palace and Orlando's Column. Get the most out of your time in Dubrovnik by taking this informative and relaxing 4-hour guided panoramic tour of the city. Cruise around town in a comfortable vehicle, stroll the streets of the UNESCO World Heritage-listed Old Town, and then ascend Mt Srđ for an eye-poppingly beautiful view of the Old Town and the surrounding Adriatic Sea — all while learning about the history and culture of this stunning city. Exploring Dubrovnik Old Town without a guide may mean you miss out on important highlights and their backstories. This private walking tour ensures you cover all the UNESCO-listed city's must-sees, get your bearings, and glean the background you want with a guide who's dedicated solely to you. Stroll the marble-paved Stradun, take in the Rector’s Palace, Cathedral, Onofrio Fountain, and more, and get the full picture on Dubrovnik’s history as a major medieval power. Explore Dubrovnik, a UNESCO World Heritage site, on this comprehensive full-day tour with a small group. With a guide following a curated itinerary, you'll be sure to hit all the important sights in one day. Traveling with a small group means you'll have plenty of chances to ask questions and you'll get personalized attention from your guide. Get an insider's view of Dubrovnik with this informative and entertaining walking tour. After getting picked up at your hotel, make your way to Old Town, as the guide points out landmarks of interest along the way. Begin the walking tour at Pile Gate and then meander down the 'wide' limestone-clad street, Stradun, Old Town's version of Broadway, stopping at the Franciscan Monastery, the city cathedral and Rector's Palace, among others, to learn about the history of each spot. Depart Dubrovnik with a sense of history and a deeper knowledge of the place with this guided walking tour of the city. Start at Pile Gate and head down the famed limestone-clad street, Stradun, stopping along the way at key points to learn about the Franciscan Monastery, the Sponza Palace, the Rector's Palace and the cathedral, among other sites. Learn about the Serb shelling that took place here in 1991 and see the incredible medieval walls that surround the Old Town. Split from the city of Split for a day and discover Dubrovnik, the 'Pearl of the Adriatic,' on this full-day guided trip. During the 4-hour drive along the spectacular Dalmatian Coast drink in the views of the shimmering Adriatic Sea while getting a head start on the history of Dubrovnik from your professional guide. Once in town, begin a walking tour of the limestone-clad streets in the Old Town. Walk down the Stradun, the main promenade in town, and see the Franciscan monastery with its gorgeous gothic courtyard, Orlando's Column, Rector's Palace and Cathedral of the Assumption, among other sites. Then, before heading back to Split, spend some free time wandering on your own.